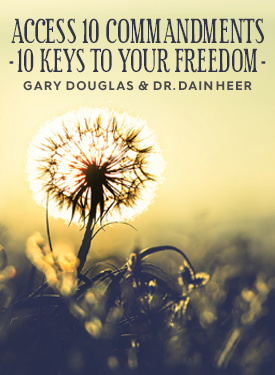 Welcome to 10 Commandments - 10 Keys to Your Freedom Teleseries! The 10 Keys to Your Freedom are a way of living that will help you expand your capacity for consciousness so that you can have greater awareness about yourself, your life, this reality and beyond. What if everything you have as a limitation is something that you have the capacity to unlock? What is Access 10 Commandments - 10 Keys to Your Freedom Teleseries? What if there were 10 simple tools you could use to create the life you've always desired? What contribution could you be to a truly conscious world? As an infinite being, you're always in question, never in the answer. When you come to conclusion or try to come to answer, you have to come to judgment. What if total freedom from limitation could be a reality for you? It's not about what you've decided ought to be an interesting point of view; it's about every single solitary thought, feeling & emotion you have is just an interesting point of view because none of them are yours to start with. Join Gary Douglas and Dain Heer in this unique 10-week teleseries on the 10 Commandments of Access Consciousness - using them, applying them, and what it looks like to truly BE them. These keys are an integral part of the Access Consciousness Foundation class and are a prerequisite to becoming an Access Facilitator. Thousands of people around the world have used these Ten Keys to get over depression, lack of money, relationship issues, body problems and many other situations that have seemed insurmountable. What is great about you that you aren't getting? Are you ready to begin creating the life you've always known was possible but haven't yet achieved. These are the keys to everything that will give you total freedom and everything that makes it easy to be conscious in life; the stepping stones to choosing your life instead of being at the effect of someone else's point of view or anything else. When you demand to use them all of the time, they become a way of being and having, All of life comes to me with ease and joy and glory. as a reality.